We have been selling republic storage lockers for over 48 years. 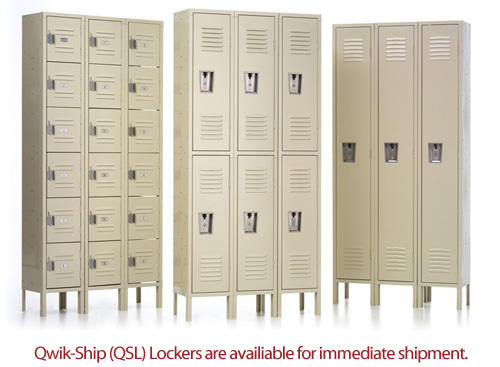 Quick ship lockers are offered in tan or gray only, any other colors are a production order which take 6-8 weeks currently. Quick ship colors are louvered, 6” legs, recessed handle and available in a single tier, double tier, five tier, six tier and 16 person locker. Republic Storage traces back to 1886 with John and Wilson Berger of canton Ohio began forming lengths of metal conductor pipes. In 1921 Berger manufacture merged with united furnace and started selling steel furniture, storage products, lockers and shelving units. By 1930 Republic storage was created and building not only lockers, but essential components for ships and planes throughout the war years. Post war the company was focused on lockers and storage units. 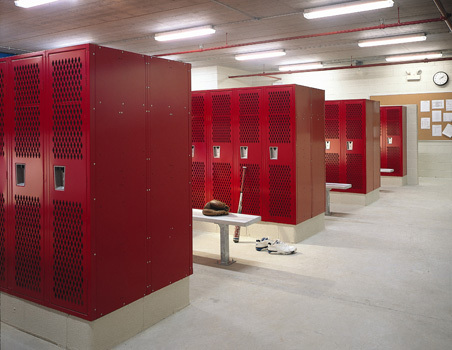 Republic steel also offers heavy duty ventilated lockers that are great for locker rooms with moisture; these lockers have a diamond perforation in the doors for extra ventilation. These heavy duty athletic lockers have 14 gage steel doors and 16 gage steel on the body parts. Republic storage also offers the all welded lockers with 14 gage steel and 16 gages for the body parts. Please fax or email your info on all quotes to us. Any questions please contact us for help.